A restaurant that has four stars on Yelp might be a big hit with a lot of people, but there’s no guarantee that you in particular will like it. What if you can’t stand Cuban-Japanese fusion? For you, that restaurant should be ranked zero stars. That’s the premise of personalized dining recommendation app called Ness that’s debuting a new version of its app on Wednesday. Ness first came out with its free iOS app in 2011, but has gone back and improved the ability to predict what users will like. The app is a slick, beautifully designed way of helping you determine where to eat by asking you a few questions to get an idea of what you like and don’t like. It then adapts and learns from how you continue to use the app. Think of it like Pandora(s P) or Zite, but for eating out. The subject happens to be dining , but what Ness is up to is really about maximizing the accuracy of personalization. With its own algorithmic models that use machine learning technology, Ness takes the user’s location, time of day, stated preferences and behaviors within the app (ignoring things, dismissing things) to basically build a dining guide for you. Its determination of how much you’ll enjoy the place or the cuisine is represented by a percentage grade out of 100. Time of day is an example of a key indicator for the new Ness: if it’s mid-day the app will automatically search for good lunch places. If it’s nighttime, it looks for dinner spots. 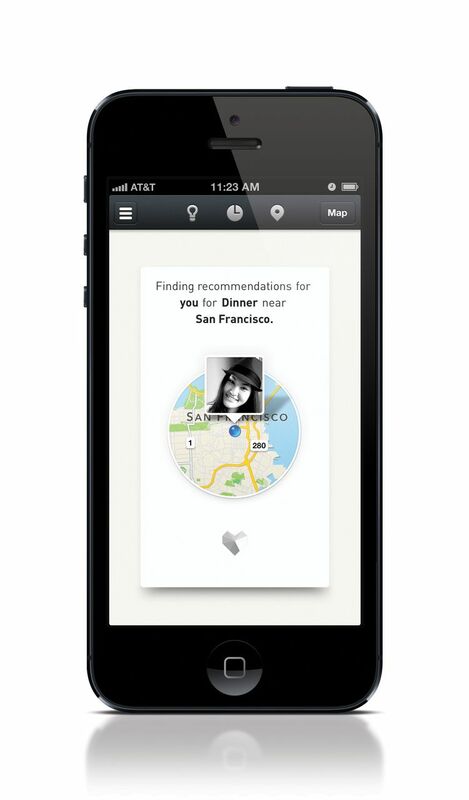 It also detects your location to determine how far you’d have to go for food. If you’re in a densely packed metro area during the work week, you’re probably just looking to grab something close by, so Ness will search within a few-block radius for food options. If you’re in an office park in a suburb, Ness knows you’re going to have to drive a couple miles to find lunch, and will recommend places accordingly. Ideally, this is supposed to happen automatically, without the user having to constantly remind the app of these search constraints. What you don’t do is also important for Ness’s algorithm: if you search for coffee but never click on Starbucks when the option surfaces always opting instead for a local coffee bar, Ness will start to assume you don’t like chain coffeeshops in general and stop showing you them. Like recommendation services in other genres, like music or news content, the idea of Ness’s more personalized approach is not to keep you in a bubble of your established tastes only. It wants to understand what you like and point you toward places that you’ll enjoy, but not the same places all the time. “We’re focused more on the moment of delight: ‘Oh, here is a place I had not known about,'” said Reese. “It’s less about making sure you don’t have a crappy meal.” In his mind, that’s more of what Yelp is for — ensuring a minimum level of quality. The release of the 2.0 version of the app on Wednesday is just one step, he tells me. After the service understands what you like, the next step is for Ness to understand what it is about a place that makes you like it — the ambience, the food, the location, the staff, etc. But you’ll have to wait for improvements in that area in future updates.